March 21, 2019 by Kate Irwin	in tutorials, Uncategorized. If you’re a small business owner, blogger, or influencer, chances are you’ve heard how important it is to build your email list. Relying solely on social media to reach existing and prospective customers has its limitations: you don’t actually “own” your followers, glitches and downtime can impact your ability to contact them, and you’re at the mercy of the platform in question. Your email list, on the other hand, is an asset you actually own. You can keep in touch with your list on your own schedule and you have a far better chance of actually reaching them since your communications arrive right in their inbox, not relying on an algorithm to show your content to the right people at the right time. 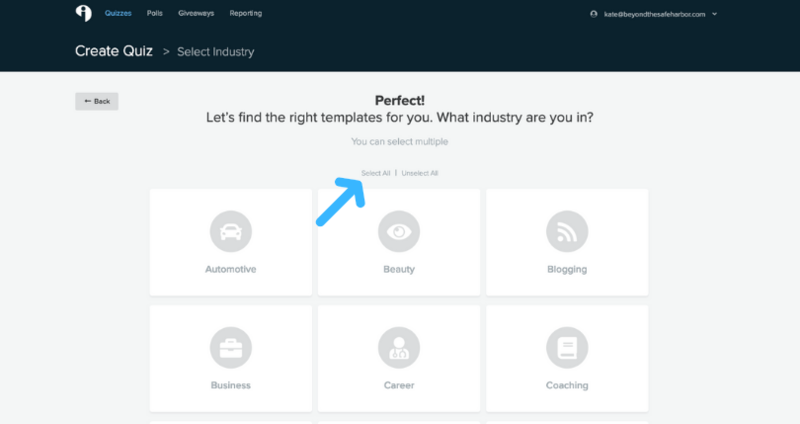 The question, then, is how do you grow your email list? How can you build a list of leads to contact? And how do you encourage people to sign up for your updates? One of the best ways is to make your own online quiz and encourage respondents to provide their email address at the end. I’ve had tremendous success by using Interact Quiz Builder to do just that. And in today’s post, I’ll be sharing how to make your own quiz, using my “What Type of Bride Are You?” quiz as an example. This quiz alone helped me generate close to 300 leads in under a year. 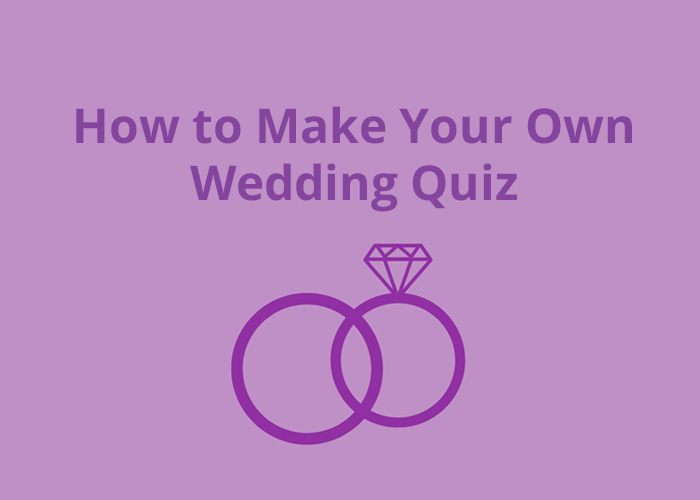 Make your own wedding quiz! Quizzes are an engaging tool with multiple benefits. Here are a few reasons why they’re a valuable tactic for your business. Adding an email capture form to your quiz yields an average conversion rate of 50% which is often much higher than other lead magnets. That means that on average, half the people who take a quiz will opt in to get emails. 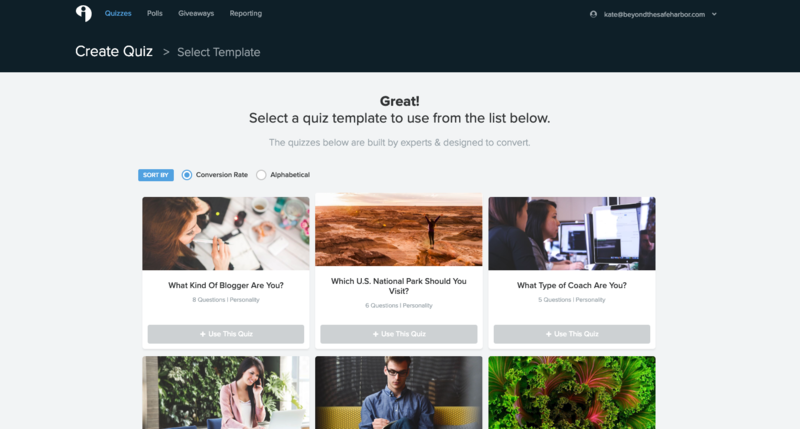 Since quizzes generate personalized results, they’re a great opportunity to recommend relevant products, services, and content. Interact reports that personalized product recommendations generate 230% more sales than non-personal ones. 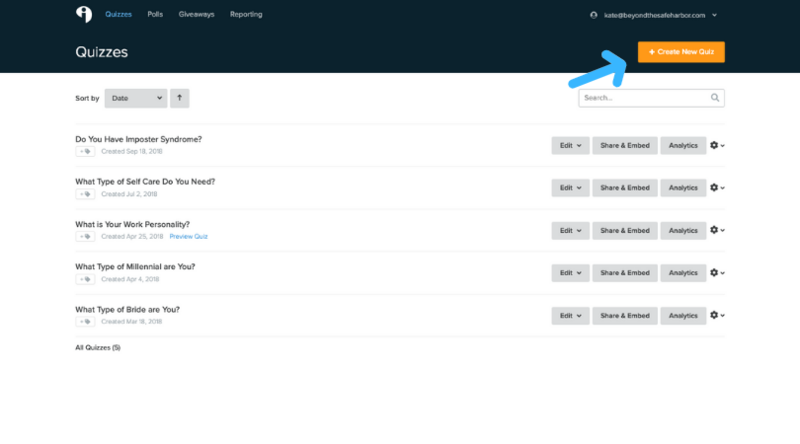 Use the results section of your quiz as a call to action to encourage respondents to check out an article, visit a product page, or take a specific action. According to Interact, 10% of people who take quizzes share their results on social media which helps spread the word about your quiz and encourage more people to take it. There are several key steps to take to make the most of your quiz. First, brainstorm and choose your quiz focus. Spend some time thinking about your ideal reader or customer. If you’re looking to drive leads for a particular product or subtopic, identify that too. You want to get a sense of your target and objectives. If you’re looking for more inspiration, Interact has a great post about how to determine your quiz strategy. In my case, I wanted my quiz to be a personality quiz that tells people something about themselves. Specifically, I wanted to target newly engaged women, or “brides-to-be”. At the time, I had been writing a lot of wedding-related blog posts, and I had a lot of valuable content to offer them. Knowing that helped guide my thinking. Instead of a quiz like “What type of venue should you choose for your wedding?”, something like “What type of bride are you?” would make more sense. This is because it would tell people something about themselves, which would be appealing to my target audience. You can either use one of Interact’s templates (as-is or with edits), or create your own. In that same post mentioned above, Interact provides a worksheet so that you can begin sketching out and designing your quiz. Creating an outline before actually building your quiz will save time and effort. While I ended up creating my own quizzes later on, for my wedding quiz, I used one of Interact’s templates and simply made some tweaks to it. To do this, navigate to your Interact Dashboard and then click “Create New Quiz”. In my case, I selected “Template” because for my first quiz, I wanted to be able to work with an established template. You can, however, choose to build one from scratch if you prefer. You’ll be prompted to select the category for your quiz, to help narrow down the results. In my case, I wanted to see all of the templates and then search within them, so I clicked “Select All”. This was because I wasn’t sure where a wedding quiz would be categorized. If you were looking to create a specific type of quiz and you were sure of the category it would be found in, you could select one category (or more!) and go from there. You will then be prompted to select your quiz type. I chose “Personality”, because I had decided earlier that that was the type of quiz that would work best for my audience and objectives. You will then be presented with a bunch of available templates that match your criteria. To quickly search them, I searched the page for the word “bride” to see if any came up. If you have a PC, use Control+F to search the page. On Mac computers, Command+F will work. I then typed in “bride” and “Enter” to see whether any quiz titles included this word. In this example, one quiz came up, and it was exactly what I was looking for. I clicked “Use This Quiz” under the “What Type of Bride Are You?” quiz in order to select it. At that point, you’ll be able to customize your quiz. 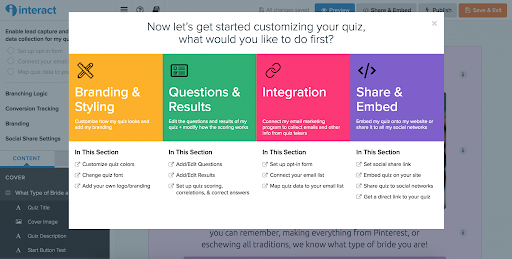 Here’s an overview of the components available in the quiz builder. 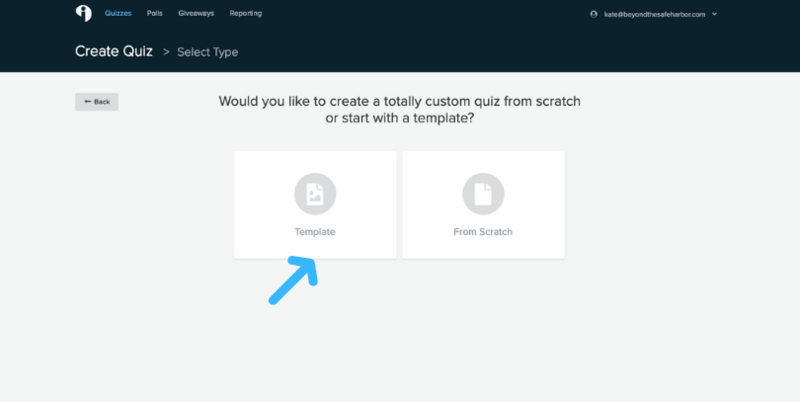 Leveraging Interact’s easy-to-use software, create your quiz. Their Learning Centre provides tutorials to help you get started on the step-by-step process. In my case, I updated the images, colours, and some of the copy to better fit my brand and audience. Below is a screenshot of some of the style changes made. Fourth, embed and/or share your quiz. 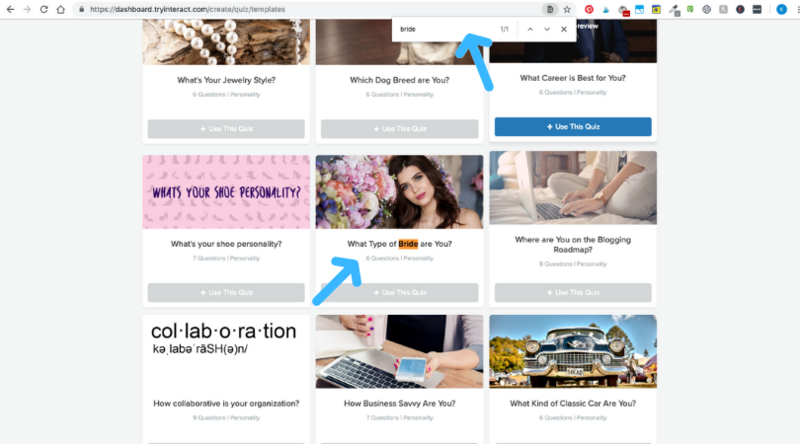 Interact offers many ways to share your quiz from embedding it on your site to creating a pop up to setting it up as a Facebook ad, and more. I took advantage of many of these placements. First, I created a dedicated blog post with my wedding quiz so that I could easily drive people to it from Pinterest. That way, people would end up on my site and would be more likely to check out other relevant content. I also linked relevant blog posts in that article. Second, I added an announcement bar to the top of my website calling out the quiz, which was easy to set up through the Interact Plugin for WordPress. Third, I tried out Facebook ads with the quiz. I didn’t see great results after a few days so I turned it off, but I may revisit it in the future and tweak some of my targeting criteria. I set it up where I paid for impressions (vs. clicks) as it seemed to be the only way to try it out with a small budget. But I ended up not getting any clicks because of this approach. I may try again in the future. Last, I embedded the quiz in relevant posts like this one. The timing was perfect since that was my most trafficked post for a few days, and I was able to take advantage of the traffic boost by converting visitors into email subscribers. My experience working with Interact Quiz Builder over the last year has been fantastic. 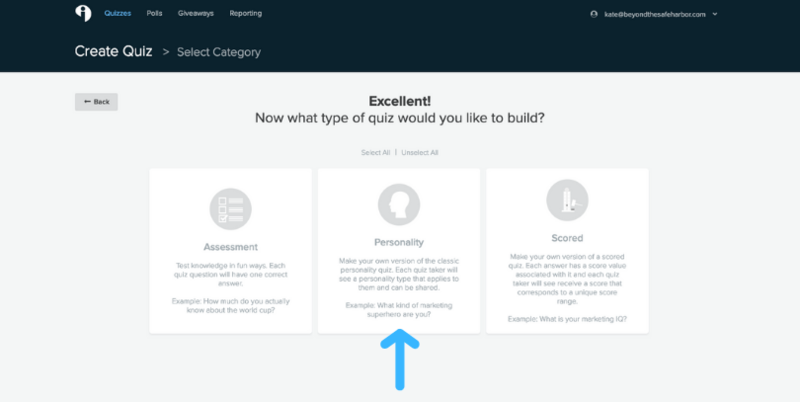 First, their quizzes are incredibly easy to build, and I love having the ability to leveraging an existing quiz or make my own. I was able to customize a quiz on my own and found the overall interface to be intuitive. Second, integrating the software with my email provider, MailerLite, was a breeze. In a few clicks, everything was set up and I was able to start collecting leads. And third, their support is wonderful. They have demo calls twice a week to show you how to build a quiz, and tons of online resources that you can access at any time. In summary, creating a wedding quiz (or a quiz of any type!) with Interact is simple and straightforward. And it’s a fantastic tool for gaining leads and growing your list. Kate Irwin is the Founder of Beyond the Safe Harbor, a women’s lifestyle blog, and also manages several other side hustles including a successful Etsy shop and freelance writing and consulting business. 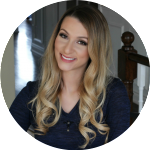 Her blog provides practical tips, empowerment, and inspiration to women looking to live their fullest and most meaningful lives, whether that be making an impact in their communities, mastering their finances, or bettering themselves as individuals.